As frequent readers of this column will know, it has served as an unashamed vehicle for the promotion of the ‘Anthony Stokes for Ireland’ campaign. This column has time and again been an agitator to have the young, stylish, swashbuckling striker wear the green jersey. The basis for the argument was that Stokes deserved at very least a chance, having been banging in veritable truck loads of goals over the last couple of seasons for Celtic and Hibernian. Well, this week Ireland came calling, and Stokes basically insulted everyone who has ever stuck up for him in this long running discussion by thumbing his nose up at his country. The bare facts. Ireland played their Northern counterparts on Tuesday night in the ‘Carling Nations Cup’, obliterating them 5-0 in a game that could have finished anywhere between 7-0 and 10-0 without too much hyperbole. Stokes was picked for the squad and forthcoming matches, including a genuine, bona-fide European Qualification game against Macedonia. Stokes refused the call-up. His explanation? Stokes held every single card in this argument right up to this lazy decision. Irish management was under pressure from many angles to get him involved. Fans and fellow professionals alike all clamoured for the free-scoring striker to get his chance. Sadly, it would appear Stokes’s bluff was called. The excuse he rolled out is in itself ‘tired’, and makes little sense, as anyone with a cursory knowledge of Celtic know that Stokes has taken a back-seat lately to other Celtic strikers. Time and again lately Stokes ‘rode the pine’ for the big games, watching as Georgio Samaras amongst others played instead of him (When Samaras is playing ahead of you, you need to look yourself in the mirror and ask yourself some serious questions). His rather pathetic decision was further blown apart last night during the somewhat unexpectedly enjoyable Scotland v Wales encounter. To digress for a second, Irish soccer fans should also be feeling a little red faced this morning. Scotland managed to fill an entire end of the Lansdowne stadium last night, travelling across the water in droves to see their heroes. Lansdowne was almost empty by comparison on Tuesday night. A healthy tip of the cap to those incredibly loyal Scottish fans. Back on point, their team responded to their loyalty in kind, going behind 0-1 (to an admittedly desperate Welsh side) before storming back to win 3-1. Central to the comeback was the work of Charlie Adam. Yes, the same Adam who spent a grueling last few weeks trying to keep his club Blackpool up in the Premiership, unsuccessfully sadly. Adam played his heart out and when his country called, in a tournament that Stokes has seemingly deemed below him, Adams answered the bell and played 80 minutes. I watched the game and I can tell you, Adam literally ran his socks off. 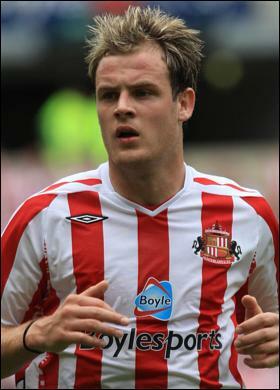 Stokes could learn a lot from the mercurial Blackpool midfielder. The tragedy of it is, Stokes is absolutely chock full of pure, raw talent, as evidenced by goals like the above. There is nothing Stokes can't do on the football field. He simply has to find some focus, some dependability and, sadly, some loyalty. The latter sound a bit strong? So it should. When your country comes calling, you answer that call. Tired or not.